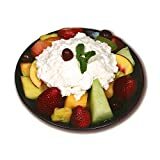 Save on Cottage Cheese at Smokey Robinson Foods. Top brands include Upstate Niagara Coop. & Upstate Niagara Coop. Hurry! Limited time offers. Offers valid only while supplies last. Upstate Niagara Coop 4 Percent Milk Fat Cottage Cheese, 5 Pound - 4 per case. 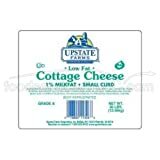 Upstate Niagara Coop 1 Percent Milk Fat Cottage Cheese, 5 Pound - 4 per case.